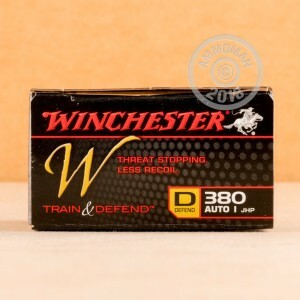 Winchester Train & Defend ammunition makes realistic target practice easy with matched pairs of JHP and FMJ cartridges. This allows shooters to shoot an inexpensive target load that has the same external ballistics as their carry ammo. In addition, Train & Defend ammunition is engineered to provide reduced recoil without sacrificing all-important terminal ballistics. This is particularly welcome in this .380 ACP version, cutting down on the "snap" common in subcompact carry pistols and effectively increasing the shooter's accuracy and aimed rate of fire. 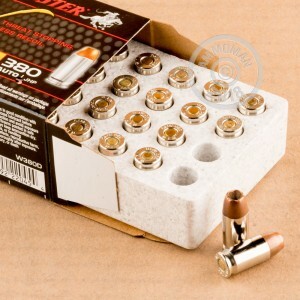 This particular ammunition comes in boxes of 20 and belongs to the "Defend" component, firing a 95 grain jacketed hollowpoint bullet at about 950 feet per second. It will perform well in a variety of popular .380 Auto carry pistols including the Glock 42, Ruger LCP, Walther PP, Colt Mustang, and SIG P238. Winchester Train & Defend ammo is manufactured in Oxford, Mississippi using non-corrosive Boxer primers and nickel-plated brass cases.